You may look calm and peaceful on the outside as if you hold the secret to the pyramids within you and could endure anything. But just look at those flames flickering at the end of each wing… almost as if you are ready to “take off” or launch into a blazing mood which comes from nowhere. This is a time to sit back and weigh up your options without the distraction of others and what they think, say or do. Keep your own counsel and act accordingly with what is right for you. You have your eye on the outcome and know how to achieve it. 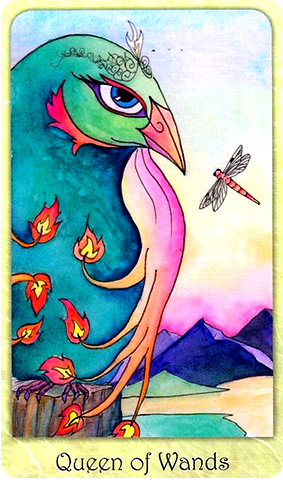 Notice how the bird in this card keeps her eye on the dragonfly… she is not about to let anything get in her way or dissuade her from the course she has chosen. You have the energy within you to make your dreams come true… wish wisely and don’t waste your time and energy on the mundane. All is happy for you financially and with stability of finances security is sure to follow. This is not only for you but also those around you that may be relying on you. If you were thinking of branching out in any endeavours to make more money, change jobs, take on a new project now would be a good time to do so. Everything seems to fall into place for you and those closest to you will back you up and lend you any support you may need. If you have been wondering how to branch out and start a new financial project that will be financially rewarding talk to those closest to you and listen to what they say. Not only what they say as in giving you support and ideas but also how it may impact on them. You don’t have to do everything on your own as success comes easily if you work as part of a team… and this team looks very much like your nearest and dearest in those around you. Don’t you look like the “cat who got the cream” or should I say the wine glass! Happy times are ahead for you and a lot of that will come through your own creativity and sense of fun. Do not try to hold yourself back just now and think you have to play it safe. I’m not talking about going out and getting drunk to have a good time this is more about finding your inner child through the arts. Being creative, having fun and generally enjoying yourself. What would it take for you to laugh again? How would you feel if you could truly let go and feel free to do so? The hues of mauves and pinks in this card imply a self love through looking at your spiritual side. The freedom seen in the way the head is tossed back and the look of laughter shows that all good things are coming to you and you don’t need to wait long to reap this as it is within you already. There’s a lot of growth going on around and within you. Coupled with this is the fact that you seem to be able to balance what you want and how you will get it. The yin/yang symbol which is half covered by the wing seems that you are keeping something close to your chest that will serve you well and whilst this may be about self love and balancing that which you have going on in your daily life. Another part is that you may not be willing to give so much of yourself for the time-being and simply enjoy the fact that you are who you are and no one is going to tell you otherwise. Do not be surprised if you find others gravitating towards you with all that self love set against the happiness of the open petals of the sunflower. I’m sure you’ll feel like sharing your own inner joy around and in return something new may blossom from it. It’s time to spread your wings and reach for the sky. How very fitting for you to get this card Leo as the usual image for the card of Strength is a lion being held by a woman as if she is taming the beast within. If there is anything you need to take heed of within yourself that is holding you back ie a habit you wish to break then now is the time to reach for the stars and realize anything is possible. There is a metamorphosis feel to the image in this card as old habits and beliefs are released and new ones are put down. The branches of the tree may look bare for the time being but just look at the gorgeous image that is ascending into the heavens from these branches. This is you. Grab it with both hands and don’t look back… or down! Looks as if the dawning of a new day and a new era of your life coming into view. The sun is shining in the background but is it setting or rising. That is up to you and whichever way you wish to view your life just now or whatever plans you have going on around you. If you are thinking of ending something then there is opportunity beyond that ending. If you are thinking of starting something then there is new growth which arises quite quickly. It’s hard to see which way you will choose to go what with the colors of yellow for mental clarity and purple for spiritual thinking dominating this card. Perhaps that is a clue to how you will proceed though. Do not rely on one or the other but rather use your spirituality, intuition and mental clarity in tandem and go for the changes you with to make. As a side note the colour blue denotes communication so you may wish to speak to someone before you make you mind up fully. So many choices… so little time. The 9 of cups is also known as the wish card and in this image 8 of the 9 cups displayed are all being “ignored” by you as you have your eye on only one course of action and may be doing yourself a disservice by ignoring what other courses of action are open to you. There is no right or wrong answer for what you do next as all opportunities look equally appealing so you may wish to ask yourself why you have discarded the other 8 cups (opportunities) to focus fully on only one. By doing this you may come to see that the one you are focused on would be easier to attain if you broadened your horizons thus giving yourself a better chance of attaining in. Sometimes the easiest path to your goal is through balancing other things around you. Your inner sensual self is released within the 2 of cups and it looks as if nothing can hold you back whilst you explore your own feelings and the feelings of those around you with apparent abandon. This is not a card about holding back. It is about jumping in and getting caught up in the moment. Whilst there is a certain balance to the cups in this image with both the Sun (masculine) and Moon (feminine) energy depicted and showing through it seems you have your eye on something else… namely the bright pink images dangling in front of your face. Now pink stands for love and this is the type of love that you go after without a second thought. The bright pink image reminds me of a carrot and you may like to think of that when you are running after the object of your affection… will you be the one dangling a carrot in front of them or will it be as if they are a carrot dangling in front of you. Either way the implications are pretty clear… you won’t be thinking with your head. A very suggestive card which shows you may not know if you are up or down just now or in what direction you should be going. The Fool is the first card of the major arcana and in this version the moon is new showing a new path for you or a totally different direction you may take. It’s not clear whether you are already on this course or if you are about to launch onto it as the bird doesn’t show if it is “taking off” or “falling down”. What is it that you need to use your intuition with just now? It may be a longstanding problem or the need to use it more in your everyday life but right now intuition is featuring strongly for you. The full moon in this card denotes that your emotions might be more highly strung than usual or you may be thinking back to when the moon was in the last quarter (in the past week) or what you will do when it is its third quarter (in the next week). But whatever you are dreaming or thinking about it doesn’t look as if it is set in the here and now but rather something you need to use your intuition with to find the answers to propel you forward. When doing this you might like to contemplate the 2 trees in the background… one white… one black… which is also suggesting your need for balance. Is there something you have been waiting for perhaps news or the outcome of a problem? It may be that you are coming to the end of your patience and need answers now rather than waiting it out and letting things take their course. In this Knight of Wands there is a fire over the heart… depicting impatience and passion and a sword in the hand…. depicting action through words and thoughts. By all means go after what you want and if this is a person who is in your life pushing you for action and/or answers then take the steps you need to not be swayed by them and their impatience. If you rush into something you may miss all of the facts. If someone is pushing you they may not be telling you everything you need to know to make your own mind up. And if you feel a little impatient… try doing something else to work off the energy. Your mind may feel awash with new ideas and thoughts that have not yet found a comfortable place within you yet. Rather than fighting these and turning your back on something that does not sit well with you realise you have the capacity to face what you need to and the intellect to think your way through it to an acceptable solution. Intellectually you are very strong and if you have something to say to someone this is the time to do so. Do not be put off by their arguments if they do not agree with you, rather, find a comfortable middle ground together and if they are not open to this then ask yourself how long you have been trying to placate them and has it been worth it. You may be thinking more clearly now than you have been for a long while… listen to your own thoughts… and act on them. The cards used for this month’s tarotscopes are from the Dream Raven Tarot collection, designed and created by Beth Seilonen, published by Schiffer Publishing. Used by generous permission. These beautiful cards can also be found at her Etsy storefront. Please visit and “like” her Facebook Fan page! It is the first time I visited this page. I like it quite a lot. The Tarot cards are wonderful, colorful, and with full of mysteries that need an expert interpretation, which also is fully provided.